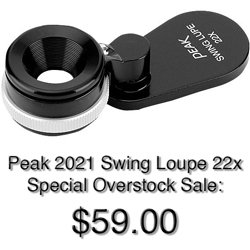 This is a special purpose loupe with a magnifying power of 7 times. It belongs to that category of scale-loupes with and affixed transparent glass scale, which can be placed in contact with the object under examination, so that you can measure the length of the object very easily and accurately with an error of less than 0.03 mm. However, the magnifying optical system of this loupe is not conventional, but is “telecentric”, i.e. characterized by a small opening fixed at the focal point of the lens system, through which you can measure the length and width of not only flat objects, but also three-dimensional ones such as small spheres, cylinders, etc., without the error caused by parallax. This handy instrument is equivalent in its principle to expensive profile projectors. The lens system, composed of three elements in two groups, has been specially designed for the present purpose. 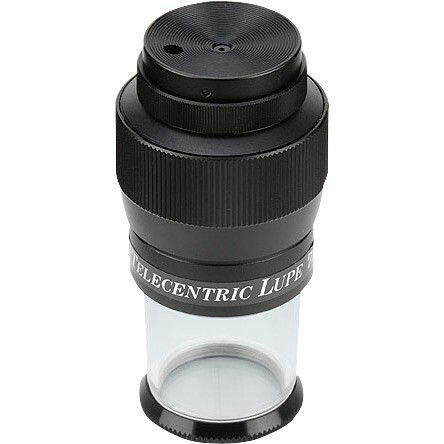 To use the loupe, first adjust the distance between the glass scale and the lens system by turning the knurled outer barrel until the scale can be sharply observed by your own eye through the opening with the largest diameter (3mm), which can be selected simply by turning the turret ring at the top of the loupe. Then place the loupe upon the object to be measured so that the scale plate is in contact with it, and read its length by the scale. The scale is engraved 20 mm in total length at every 0.1 mm intervals, so you can measure the length of objects with an error of less than 0.03mm. When measuring three-dimensional objects, the opening with the minimum diameter (1mm), or preferably the one with a slit of 0.5mm in width should be used; and the orientation of the slit should be kept perpendicular to the direction along which the length of the object is to be measured. Even in these cases, the portions of the object that are not in contact with the scale plate may be fuzzy because they are out of focus. However, no error can occur in the measured length, as long as you measure the center-to-center distance of the blurred image, thanks to the characteristics of the “telecentric system. The low brightness of the image due to the small opening can be compensated for by higher illumination of the object. -13 reticle scale, inch scale on horizontal plane, zero left reading, scale divisions 0.005"
Full range of standard reticles available are shown on this page.